In the centre of the mandala there is Vairocana the Omniscient, white like the conch and the full moon; he has four faces and is seated in the vajra asana on the lion throne, making the gesture of meditation; he is adorned with all ornaments . Vairocana is seated here in vajra asana on a lotus pedestal, instead of the lion throne. While the body on the whole is not white in tone, there is a silver sheen to the necklace, the hands and portions of the earrings which suggests either a silver or high tin content, although in other places, the reddish copper of the alloy is visible. 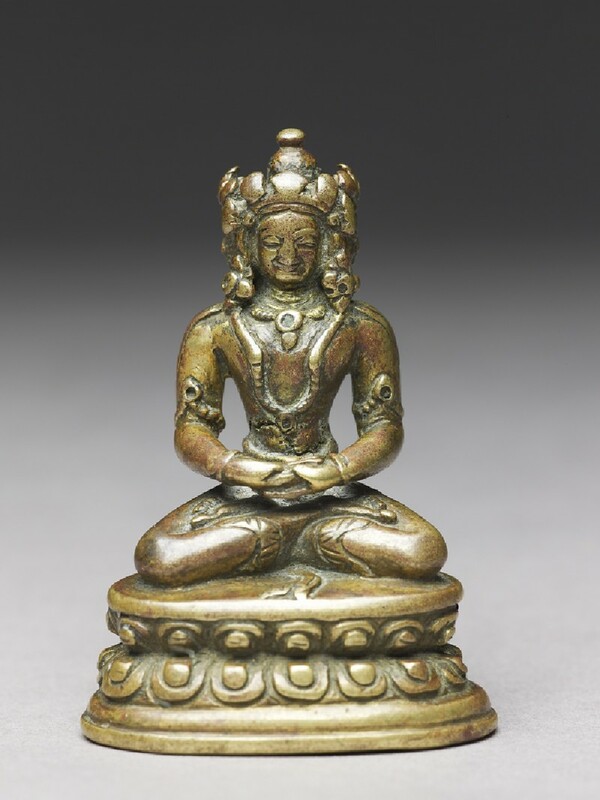 In a detailed conservation study, Chandra Reedy has described this Buddha as hollow cast, with a diamond-shape core, now sealed with a separate hammered-copper base plate; metallurgical analysis of the alloy was not made . The four faces of Vairocana all have a placid expression and a gentle smile. The front and back faces are rather worn from worship, but the side view allows us to see his pleasant facial features and demeanour. The heads are organized to share earrings, thus there are in all four pendant earrings, and one ushnisha with round jewel finial for all four faces. The crown has eleven leaf-shaped panels which are shared between the four faces, but due to wear, their original shape and decoration cannot be determined. The thick braids fall along the shoulders. The two necklaces are very simply re n d e red, and the rounded coil in a U-shape of the longer necklace is also found in a clay Vairocana sculpture from Gumrang, west Tibet . Despite the very small size, the broad face under the impressive crown, the massive shoulders and heavy upper arms all convey a sense of strength and grandeur befitting this important Buddha. The delineation of the muscles above the waist has suffered from a casting flaw, extending the whole length of the stomach, creating a small recess, like a scar. The facial features of the recessed oval in which the almond eyes gaze downwards, the receding chins, and the distinctive body proportions suggest an attribution to western Tibet in the eleventh to twelfth century. The lotus pedestal with two rows of perfectly aligned petals in the front only is also characteristic of western Tibetan sculpture of that period. 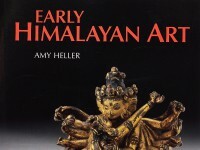 1 Reedy, 'A Buddha within a Buddha: Two Medieval Himalayan Statues'. 2 The Tibetan term is Kun Rig, literally, 'Complete Knowledge'. 3 For discussion of Rin chen bzang po as translator, see Skorupski, Sarvadurgatiparisodhana tantra: Elimination of all Evil Destinies, p. xvii. 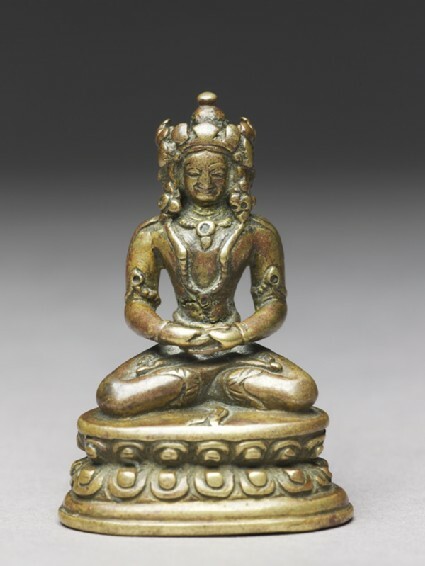 For an 11th-12th century clay sculpture of this aspect of Vairocana, see Luczanits, Buddhist Sculptures in Clay, fig. 117. 4 This description is translated from the Tibetan text reproduced in Skorupski, op. cit., pp.311-13: it is very succinct, in part to keep the metre of the text. Thus the writer has merely written rdo rje (i.e. vajra) rather than the full expression rdo rje dkyil krung, i.e. vajra asana, which is often erroneously translated into English as 'full lotus posture'. 5 Reedy, op.cit., p. 99. 6 Luczanits, op.cit., pl. 117.